What immediately made me think was the indicated connection between the Command and undo/redo. What do they have to do with each other? “If I’m not sure whether a system needs the Command pattern, I generally don’t implement it, for I find that it isn’t that hard to refactor to this pattern when the need arises. However, if your code is getting into a state in which it will be harder and harder to refactor to the Command pattern and there’s a good chance you’ll soon need an undo/redo capability, it may make sense to refactor it to use Command before doing so will be impossibly hard. It’s a bit like taking out an insurance plan.” – ibid. And again, the question comes to mind – what does undo/redo have to do with the command? Those are related concepts, I admit, but still distinct concepts – not two, but three distinct concepts – and they should not be mixed together when making decisions. Undo/redo functionality is best applied when commands are already added as an explicit design element. In that respect, we can say that command is a prerequisite for undo/redo. But the opposite doesn’t hold. If the system doesn’t need undo/redo, that doesn’t mean that we should keep away from implementing the Command pattern. And even with Command pattern implemented, you will quickly realize that adding undo and redo functionalities (yes, functionalities, two of them!) can easily be left for later development. As code evolves, as the need for them arises, these two functionalities can be added to the affected commands. Command pattern is not an insurance plan, as the author suggests, but a regular evolutionary curve of the design like any other. One of the most typical situations in object-oriented design occurs when one object, Context in the diagram below, manipulates a large body of objects, named State in the diagram. State doesn’t have to be a true collection of data. It can be anything that is being manipulated – a file, a document content, an object model of a monetary transaction, anything. The name State simply indicates that this object graph will be different after an operation has been performed on it. Problems start piling up when number of possibilities begins to grow. If context can change the state in many ways, then its own implementation will become complex. The surface of the Context object will begin to grow beyond reasonable boundaries, as the next diagram indicates. Try to imagine a graphical application as an example, where state is the image, or a diagram which is being edited. Context would hold the diagram, and expose numerous operations, such as adding a shape, scaling, moving or rotating a shape, substituting one shape for another, changing line and fill color and patterns, let alone operations such as cut/copy and paste, or saving and loading the diagram. That is way too many responsibilities for a single class. That is where Command pattern comes to the table. As it usually goes with design patterns, its duty is to turn responsibilities on the side, so that instead of having all of them located in a single class, each responsibility becomes one separate class. If we wanted to paint the surface of a shape in that graphical editor, then there would be a class which only knows how to paint the surface. If we wanted to scale the shape, then there must be a class which only knows how to scale the dots on the drawing surface. The next diagram shows usual implementation of the Command pattern. Take a look at it, and then we will briefly discuss it. Command is an abstract entity. Context is organizing commands, and that remains its only responsibility in respect to manipulating the state graph. 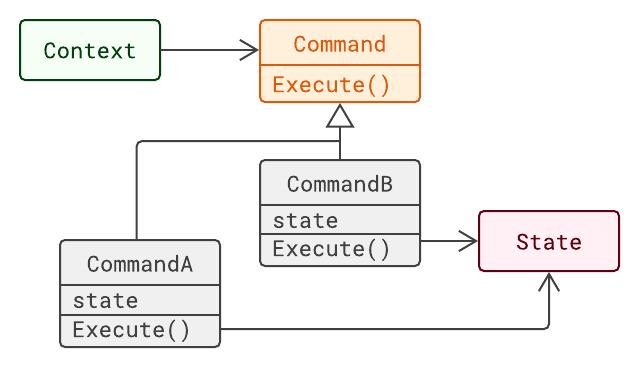 When the time comes to perform an operation, no matter how complex an operation, all that remains for the Context object is to call the Execute method on a concrete command object. On the other hand, there is an open list of concrete command classes, all of them deriving from the abstract command, or implementing the command interface. Each concrete command is responsible for one concrete manipulation of the state graph. Concrete commands can depend on the whole state graph, or only on parts of it. That is the implementation detail. The main takeaway from introducing the Command pattern to the design is that the Context object, which was bound to grow enormously, will now be next to trivial. You don’t have to introduce the Command pattern if context is small enough to survive. You don’t have to introduce the pattern if context was designed as a proof of concept, and it is not certain that it will be maintained and developed ever again. On the other hand, if development does continue, you will likely want to split responsibilities into smaller classes, and Command pattern would then be one of the natural candidates for the inevitable refactoring. Now that we understand the core purpose of the Command pattern, we can look where undo and redo functionalities fit into it. Command is meant to change the system’s state, which naturally brings the question up regarding the inverse change. Resizing a shape in a graphical editor can easily be reversed, by setting the previous size on the same shape. That operation is known as Undo. Once Command pattern is installed in a design, and every command is equipped with the Execute method, it becomes a natural home for Undo, too. 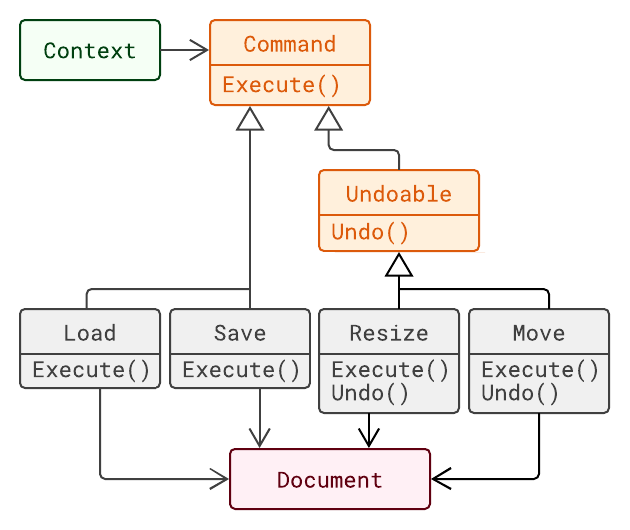 By looking at this diagram, you may come to believe that Undo is really another operation on the Command object. But that is only a convenience. In reality, Undo is yet another command. It is very easy to see that: What is Undo doing? – It is manipulating the system’s state. That is precisely what any command does. Former case shows one object with two antipodal operations (which have the same signature, by the way). Latter case displays two antipodal objects with the same operation on them. The two cases are identical. They can be morphed into one another without disturbing the Context object. Undo operation is usually added to the Command interface for convenience, and that is all. But that is not to say that the undo functionality must be a proper function. There are other possibilities at your disposal, especially if undoability is optional. Your design might allow undo of some operations, but not of others. It makes no sense to undo a save file operation, for example, even though a change in the document, before or after a save, is a perfectly valid target for undoing. This design acknowledges that only some of the commands support undoing. Resize and Move commands are undoable, while Load and Save are not. Undoable or not, each command supports the Execute method. Therefore, the caller can execute any of them, but only document-editing commands (Resize and Move) can be undone on request. There are other possible designs to the same end. The next step in developing a design may be to add the redo functionality, and that will also emphasize the command-like behavior of all three (do, undo and redo) operations. Do not mix this scenario with idempotence. Idempotent commands can be executed multiple times, but they only produce the change once. Redoing a command means to repeat the change it makes. Aim for simple re-executable commands whenever possible if you wish to support redo functionality. That, however, is not always possible. In a more complex scenario, a redo operation for a given command would be different than the Execute function. Then, you can support that function, too. Besides Execute and Undo, we would have a Redo function. That situation can be turned upside-down if we recognize, once again, that Undo and Redo are just additional commands. A command can then expose methods for fetching true undo and redo commands, rather than executing their behaviors. Below is the code which demonstrates that idea. This sample code is far from over. Managing undo and redo requires tracking command history, which is usually organized as a stack. Undoing a command removes that command from history, while redoing would push the redo version of the last command to the history. In case that DoNothing command is used to indicate unsupported undo/redo operations, you would have to pay attention to skip them. There are more complications which I will not mention here. Developing a fully functional undo/redo subsystem is outside the scope of this analysis, and I will stop here. Let me just tell you that there is no universal undo/redo solution, but the one you develop should always come out of the needs and existing system design. In this article, I have attempted to show that undo and redo operations are two additional kinds of commands, and that there is no substantial difference between the common Execute operation on a command and its mirror images Undo and Redo. It is often convenient to add one or both operations to the base command type. Keep in mind, though, that this is only a convenience. And only do that if these operations will make sense on all concrete commands. If this is not convenient in current situation, then you can still opt for representing both undo and redo as separate commands. If you reflect at where this article has started, it was about the claim that we should know whether undo and redo operations are a requirement when deciding whether to apply the Command pattern or not. In this article, my intention was to demonstrate that the opposite is true, to demonstrate that these concepts are following their separate ways. You can apply the Command pattern regardless of the system’s configuration, or current and future requirements. Command is an effective way of separating the execution context from numerous isolated operations, and that is all. Undoing or redoing commands are orthogonal axes, which can be added to the existing commands system when needed. It is equally possible to only implement one Execute function in commands and never to add undo/redo to them.